"The Collector" is the 89th Mandrake Sunday story. The story was written by Lee Falk and drawn by Phil Davis. Worldwide, an epidemic of thefts of priceless paintings. Everytime an masterpiece is stolen a strange glowing strand of beads is left at the crime scene. 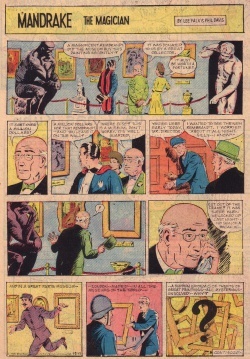 The story title is taken from the strip of December 10, 1961 (Next Week: The Collector). This page was last edited on 5 March 2018, at 18:34.